Blaze is a novel by American writer Stephen King, published under the pseudonym of Richard Bachman. King announced on his website that he "found it" in an attic. In fact (as mentioned in the afterword of Different Seasons) it was written before Carrie and King offered the original draft of the novel to his Doubleday publishers at the same time as 'Salem's Lot. They chose the latter to be his second novel and Blaze became a "trunk novel." King rewrote the manuscript, editing out much of what he perceived as over-sentimentality in the original text, and offered the book for publication in 2007. The book also contains "Memory", a short story that was first published in 2006 and which King has since worked into Duma Key. The story concerns Clayton Blaisdell, Jr. (known as "Blaze" for short, thus the title), a mentally handicapped small-time con artist who kidnaps a wealthy gentleman's baby son, in the hopes of fulfilling the dreams of George Thomas Rackley, Blaze's deceased best friend and partner in crime. The chapters alternate between Blaze's past — which covers his childhood (including how he came to be brain damaged) and his entry into a life of crime despite an otherwise sweet demeanor — and his current caper, in which he imagines that he is still constantly advised by his friend George. Despite the helpfulness of (the imaginary) George's advice, Blaze's world begins to crumble during his kidnapping venture, especially as he bonds with baby Joe. In the end, Blaze runs from his inevitable destiny back to the horrors of his old orphanage, the Hetton House. After the cops storm it, he rushes to a cave, where Joe is nearly killed, and Blaze ends up killing a state policeman and an FBI agent. He is killed by an FBI agent, and is buried only a few miles away from Hetton House and where his father lived. Many of you have been asking for more information about publication of Blaze following Steve's mention of it on his recent Lisey's Story book tour. This is another Bachman novel which he recently rediscovered. The original manuscript of Blaze was 173 pages long and was written in 1973. He has rewritten the first 100 pages. A lot of it needed editing to make it more timely since the 1973 references no longer worked. He's hoping to get it done by the end of the year. No publication deal has been signed, but he's sure there will be one. 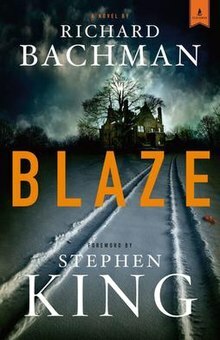 I have been thinking about [Blaze] off and on for a while and every time I would think about it... you know I did the early books as Richard Bachman books and this is going to be a Bachman because it came from the same time. It was written right before Carrie and finally I thought to myself... the reason I’ve never done it was because, in my memory at least, it was a tearjerker of a book, you know it was kind of sentimental and just kind of... every now and then I think of what Oscar Wilde said about The Little Match Girl. He said that it’s impossible to read about the little match girl without weeping tears of laughter and... you know something that is so sad it’s actually funny. ^ Leverson, Ada (1930). Letters to the Sphinx from Oscar Wilde. London: Duckworth. This page was last edited on 17 March 2019, at 08:58 (UTC).